Princeville at Hanalei (HPV) is located on the North Shore of Kauai. 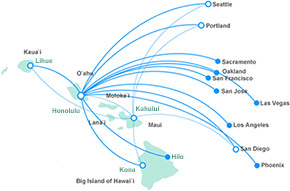 The airport lies 3 miles east of the village of Hanalei. This is an extremely small airport with just a single runway. Of course, the amenities are limited. You’ll have no difficulty locating your rental car.